When the first settlers came to Madison County (1846) there were no railroads west of the Mississippi River, and probably none west of Chicago. The mail at that time was carried by steamboats, stages and on horseback. Until the first post office was established at Montpelier (1848) the people had to go to Fort Des Moines after their mail and the necessities of life. After the post office was moved to Winterset (1849) this became the post office and trading point for nearly all the people of Madison County. Soon post offices were established in other parts of the county along stage routes or roads leading to other towns. Winterset became the starting point for these post offices. Nearly all the early post offices have been discontinued and forgotten. With the advent of rural free delivery all the country post offices have been abandoned. The post offices now in Madison County are along the line of a railroad. Winterset. The first post office established in Madison County was called Montpelier. Alfred D. Jones came up from Des Moines in June 1848, and built a log store east of Tileville, on the ridge in section 26, Union Township, then called the Narrows, and secured a post office. Mail was brought from Des Moines on horseback. Later, it was brought by stage until the railroad was built. Samuel Snyder and his brother, Alfred Snider, carried the mail. They lived at Norwalk. They would go to Des Moines one day, and then to Montpelier and back to Norwalk the next; thus they would have mail every other day. Later the office was moved to Winterset and Mr. Snyder and his brother continued to carry mail until 1852. In 1849, the name of the post office was changed to Independence and Enos Burger became postmaster. In September of the same year the name was again changed to Montpelier. May 30, 1850, the office was changed to Winterset and Enos Burger came along with the mail. The officials since then are as follows: John A. Pitzer; D. C. McNiel; Thomas C. Bird; William M. Knowlton; M. Glazebrook; J. J. Davis; E. O. Burt; F. M. Cassidy; D. E. Cooper; Thomas J. Hudson; William R. Shriver; T. J. Hudson; A. L. Wood; J. W. Miller; Ed M. Smith; W. H. Vance and Arthur E. Goshorn. Of the postmasters, let it be noted that the term of office was shortest for E. O. Burt, who held the place less than one month, while that of his successor, F. M. Cassidy, was the longest, extending for a period of nearly fifteen years. It may also not be improper to say that with a few exceptions there have been representative men and as a general thing changes have been the result of changes in the national administration rather than from any fault in the management of the office. Should some one write a true and detailed account of the exciting contests about the postmasterships of Winterset, he would have to deal with some of the most exciting incidents of our citys history. What has been said of Winterset does not apply with equal force in the case of the other post offices, although there have been exciting contests at Earlham, St. Charles, Truro, Peru, Patterson and Macksburg, but these rural offices were not much sought after, as the compensation was not sufficient to recompense the official for the labor, worry and responsibility incident to the office. In many cases, some public-spirited individual assumed these duties and responsibilities simply to accommodate his neighbors. Amazon. Amazon was the name of a post office established July 16, 1850, and discontinued the following year. It was located on the southwest quarter of the southeast quarter of section 12, Scott Township, a short distance south and west of the Union Chapel and cemetery. Emanuel J. Henkel was the postmaster. He was a physician and laid out a town there called Richmond. There was at one time a store there, kept by someone whose name we cannot learn. The mail was brought from Winterset. Banner. Banner was the name of a post office established in June 1874, and discontinued the following year. It was located at the northwest corner of the northwest quarter of section 7, in Virgina Township, Warren County, but was thought to be in Madison County. Mail was brought from Bevington via St. Charles, Banner, and New Virginia to Osecola. John S. Crawford was the first and only postmaster. Barney. This post office was established November, 1888. The following have been postmasters: J. W. Gailbraith, Richard Beardsley, B. R. Rankin, Charles Klein, J. H. Woods, Richard Beardsley, Sophia Beardsley, and Milton Stephenson. Bells Ridge. Bells Ridge was located on the northwest quarter of the northwest quarter of section 1, South Township, land now owned by C. E. Huglin. It was established October 31, 1851, and discontinued November 27, 1854. Henry A. Bell was the postmaster. It was learned from a letter that A. D. Bell was the mail carrier that was sworn in by Judge Pitzer and the mail was brought every Thursday from Winterset. Bevington. Bevington was established June 4, 1872. The following have been the officials: Cornelius Haight, R. A. Wilson, Campbell Hughart, William T. Cason, Campbell Hughart, George W. Shreeves, William W. Fraser, J. T. Cash, H. D. Harrell, Robert Clelland, Harry D. Harrell, William Cody and Merton C. Doak. Bloomingdale. Bloomingdale was established September, 1857. It was located on the northwest quarter of the southeast quarter of section 35, Jefferson Township, on land now owned by the William Schoen estate. The office was discontinued in December 1858. Henry Du DHuy was the first postmaster and was succeeded by John McManus in 1858. Brooklyn. Brooklyn was a town laid out by J. W. Guiberson and located on the southwest quarter of the southeast quarter of section 14, Walnut Township, on land now owned by L.F. Clifton. A post office was established there in February 1857, and discontinued in June 1860. The following were the postmasters: William S. Quick, William Mills, J. W. Guiberson and D. D. Drake. Charlottsville. Charlottsville was the name of a post office located on the northeast quarter of the southeast quarter of section 24, Jackson Township, on land now owned by S. D. Ford. It is said the name was selected in honor of Charlotte Welsh, wife of A. G. Welsh, the first postmaster. This office was discontinued in October 1861. The office was supplied from a mail route leading from Winterset through Redfield and Panora. Clanton. This office was established in February 1859, and discontinued in March 1894. It was located in Monroe Township, and at the homes of various farmers living near the center of that township. The first official was Blewford Boling. Then came Welsey Wilson, William H. West, L. C. McKibbon, William H. West again and then in 1876, Hugh Alexander, who handed out mail at his hospitable home until 1892, when he was followed by M.R. Sheldon and Elbert Bullock, who was the postmaster when the office was discontinued. Debord's Point. This recently discovered post office was chronicled in the 1869 Madison County History. It was located in the west center of South Township along the Winterset/St. Charles Road and Marius (Meres) Debord was the postmaster. It was in operation in 1869 but when it began and when it closed are unknown. Earlham. Earlham became a post office January 12, 1869, and Martin Cook was the first postmaster. He was followed by: John R. Thompson, Dayton Barnett, D. M. Roberts, John B. Davis, A. J. Davis, Isaac K. Wilson, M. E. Wilson, John E. Chamness, E. M. Crosswait and W. H. Dudley. East Peru. East Peru was established November 7, 1888. The following have been postmasters: Charles W. Wright, William Painter, J. M. Allen, Jr., Joseph Harwood, Robert Greene, Ullrich Z. Waechter, A. C. Creger, F. H. Greene and S. B. Hamand. Ellsworth. Ellsworth was established August 3, 1861, and discontinued August 19, 1873. It was located on the northeast quarter of the southwest quarter of section 21, Crawford Township, on land now owned by C. S. Crawford. 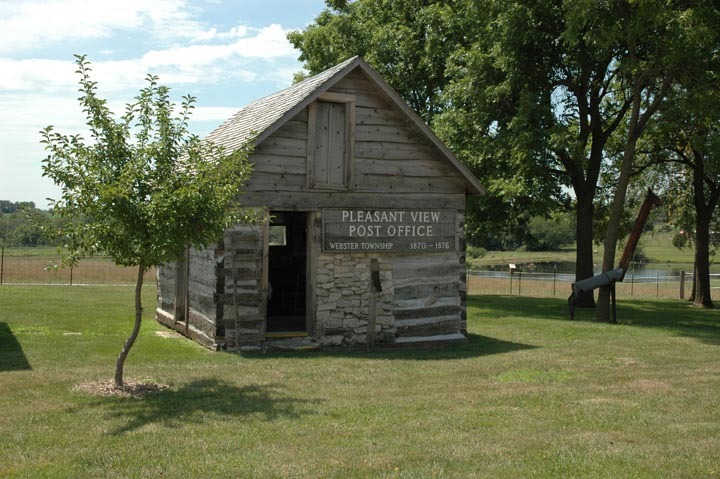 Oliver Crawford was the first postmaster and the mail was supplied by a route leading from Des Moines to Winterset. Lucinda Crawford was postmistress and then came James Bell. Foster. Foster post office was established November 7, 1879, located first at the home of Nathaniel Foster, Walnut Township, and then at the home of George H. Orr, in Scott Township. The office was discontinued October 30, 1882. Mail from Winterset, Foster, Gear to Murray. Gear. This office was named in honor of Gov. John H. Gear, and was established November 18, 1879. It was located first at the home of John Reasoner and then at the home of William N. Bowman, both of Monroe Township. It was on the mail route from Winterset to Murray. Later mail was brought from Barney. It was discontinued September 12, 1903. Gilpin. Gilpin was located at the northwest corner of the southwest quarter of section 1, Union Township, on land now owned by Nick Nolan. The office was established November 9, 1885, and discontinued January 9, 1888. H. L. Bigelow was the first and only postmaster. Hanley. Hanley post office was established December 6, 1889. The following have been postmasters: J. G. Martin, S. S. Nicoson, Lydia Schoonover, A. H. Bishop, William T. Lee, S. S. Nicoson, F. M. James, Jesse Lee, R. H. Glasgow, P. F. James, Laura E. Glasgow, W. C. Montgomery and Jennie I. Howard. The office was discontinued May 1, 1911. Harrison. The Harrison office was established April 27, 1900, and discontinued with the coming of rural free delivery, June 15, 1905. It was located near the center of Webster Township. J. B. Wilkinson, John F. Craven and George I. Rippey were the postmasters. Heaton. Heaton was named in honor of Uncle Billy Heaton, one of the early settlers of Lee Township. It was established August 6, 1858, and discontinued February 14, 1861. It was located on the northeast quarter of the northeast quarter of section 33, Lee Township, on land now owned by Julia Mulvihill. The first and only postmaster was Francis B. Wilson. Kasson. Kasson was named in honor of J. A. Kasson, for several terms a member of congress from this district. It was located in the southwest corner of Monroe Township. The office was established September 4, 1861, and discontinued June 30, 1905, by reason of the rural free delivery. The following were the postmasters: Benjamin Blyth, C. L. Kirk, J. V. Kirk, Lemuel Bishop, William I. Harris, William E. Berry, C. C. Bancroft, C. H. Lewis, William Bivin, J. M. Newton and J. M. Archer. Lefever. Lefever was located on the southwest quarter of section 31, Grand River Township, on land owned by J. M. Lefever, south of the large stock farm owned by the late L. N. Conway. The office was established April 14, 1892, and was discontinued October 3, 1894. Mary E. Lefever was the postmistress. McBride. McBride office was established May 16, 1889, and was discontinued May 23, 1901. It ws located on the northwest quarter of the northeast quarter of section 34, Jefferson Township, on land owned by August Burger. The following were the officials: Ellen Burger, D. A. Litton, Grant Taylor and George M. Powell. The mail was brought from Van Meter. McPherson. This office was launched under the supervision of Charles Polk, in June 1876. The office remained at that hospitable home for about one year, when it was removed across the road to the residence of E. B. Thompson, where it remained until it was discontinued April 21, 1900. It was on the direct road from Winterset to Macksburg and was supplied by the daily route which as for so many years been operated between these two cities. It is supposed the office got its name from the popular and well remembered pioneer lawyer of Winterset, M. L. McPherson. Maple Grove. This office was located at the home of E. G. Perkins, in Jackson Township, in June 1874, where it remained until October 1889, when it was removed to the residence of Mr. Grosscup across the road. It was discontinued in 1903. Mr. Perkins and Miss Janie Grosscup were the only officials. Middle River. Middle River post office was located at the town of Webster, December 12, 1855. Otho Davis was the first postmaster and his successors are as follows: F. M. McAferty, J. V. Nelson, J. E. Shidler, Luther Fox, F. B. McAferty, F. M. Tiddrick, Rufus Ulery, Edward Loucks, L. J. Cook and John Craven. The office has been discontinued. North. This office was located in the vicinity of Worthington, in the south part of Madison Township. It was established June 19, 1861. Alexander Kirkland, William H. Clampitt, George T. Nichols and A. M. Clements were postmasters. Mail was carried from Winterset. The office was discontinued August 4, 1869, soon after the Earlham post office was established. North Branch. North Branch was located on the southwest quarter of the southwest quarter of section 26, Madison Township, on land now owned by J. L. Peters and S. D. Palmer. The office was established November 16, 1853, and discontinued October 18, 1860. The first and only postmaster was Jacob Bennett. North River. North River, the southwest quarter, northwest quarter of section 5, Jackson Township, was established April 1, 1872, with George Rose as postmaster, The office was discontinued January 3, 1876. Ohio. This office was located near the east line of Walnut Township, in the vicinity of the Ebenezer church and cemetery. It was established February 10, 1862, and discontinued in 1889. The office was for many years in the store carried on at that place and S. M. Walker and J. W. Smith presided over its destinies for nearly twenty years. Fred Beeler became postmaster in 1881 and was the official at the time the office was discontinued, Charles W. Wrighe having served from August, 1884, till April, 1888. The mail was carried along the well-known and much traveled road leading from Winterset to Osceola. Ord. Ord was made a post office in 1888 and went out of commission June 15, 1905. It was located in the Macumber neighborhood on the Winterset and Macksburg road. C. G. Bertholf, A. M. Bertholf, E. M. Rippey, Henrietta Rippey, A. M. Bertholf and J. W. Rippey in the order named, sold stamps and handed out letters at this government station. Patterson. This office was established June 10, 1872, with Sol. B. Caterlin as postmaster. His successors in order named were: L. C. Doan, Butler Bird, W. A. Wright, George R. Branscom, Douglas Debord, George A. Wall, Harvey Brown, Douglas Debord, Thomas S. Love, W. H. Doan, George A. Potter and Roy Gillogly. Peru. For many years, this was one of the important points on the Winterset and Osceola route. The office was established April 18, 1853, and was discontinued August 21, 1903. This is the long and honorale list of worthy postmasters: B. F. Brown, Peter R. Lilley, B. F. Brown, J. P. Boyd, H. C. Wright, William C. Smith, C. D. Clark, J. W. Likens, B. R. Rankin, M. C. Lorimor, Mary E. Travis, J. W. Keller, R. F. Bush, William L. Hiatt and A. C. Turner. Pitzer. Pitzer was named in honor of J. A. Pitzer, one of Wintersets pioneers. The office was established July 13, 1889. Mary Speer was the first official and was followed by J. L. Fox, R. C. Speer, H. B. Jones, C. Van Stight and E. E. Brooker. The office was discontinued September 29, 1906. Price. Price was for a short time a post office. It was located at the northwest corner of the southwest quarter of the northwest quarter of Section 34, Lincoln Township. It was located where B. L. Thrift now lives. It was on the Winterset and Creston road via Macksburg, also the Winterset and Afton road; the former was daily and the latter tri-weekly. The office was established June 8th and discontinued November of the same year, 1876. W. C. McKibben was the postmaster. Queens Point. Queens Point was an office established May 16, 1854, at the residence of Hogan Queen, in South Township, on the road leading from Winterset to St. Charles. It was discontinued in 1855, re-established in 1856 and again discontinued in 1867. Hogan Queen was postmaster all the time. Reed [Truro]. This office was located in 1881 at the southeast corner of the northeast quarter of the northeast quarter of section 21, Ohio Township. It was on the farm now owned by Isaac Holmes, who was the first postmaster. In 1882 it was moved to the new town of Ego. In 1884 the name of the new town was changed to Truro, and the name of the post office was also changed. After Isaac Holmes, G. N. Skinner became postmaster; then Holmes served again and was followed by George Patton, J. D. Hillman, Ella Earl, J. W. Smith, George W. Caskey, J. A. Bardrick and Isaac E. Holmes, a nephew of the first postmaster, Homer D. Brown and Brada Brown. St. Charles. This office was established December 13, 1853, with David Downs as postmaster. Those succeeding him were as follows: Milton Thompson, William McCreery, L. P. Thompson, J. H. Stiffler, William L. Browne, J. L. Browne, S. S. Switzer, A. L. Wood, S. S. Switzer, J. L. Fleming, O. M. Horton and Philip D. Switzer. Venus. In 1863, there was a post office established with this classic name. It was situated near the center of Grand River Township and A. J. Hasty was the dignified and genial autocrat who first presided over its destinies. He was followed in the order named by John D. Craven, Sylvester Bennett, William O. Lee, John H. Bray, John D. Craven, E. E. Stewart, Martin Jessup, George W. Lowry and Peter H. Seay, when it was discontinued October 4, 1870. It was reestablished in 1871, with Mary A. Miller as postmistress. Then John D. Craven reappeared and was followed by J. H. Marley and J. H. Mack, when the town of Macksburg was laid out and the name of the post office was changed to conform with it. Since then the postmasters have been: Madison Osborn, B. F. Conway, J. M. Lee, D. A. Sawyer, J. D. Love, B. S. Bonham, William H. Armstrong, H. H. Saxton, L. C. McKibben and Ethel M. Bush. Wells. On the northwest quarter of the northeast quarter of section 6, Grand River Township, there lived for many years one Ira W. Brownell. At that place was established a post office, October 19, 1871, and named Wells. The office was discontinued in 1896. During the life of the post office at Wells, Mr. Brownell held an uninterrupted term of office, a period of nearly twenty-five years, which speaks well for the patience, politeness and integrity of that much respected government agent. This page was created on July 23, 2004. This page was last updated Thursday, 19-Jan-2017 21:37:18 EST .